World food in Ireland is popping up everywhere and it’s not exclusive to Dublin. As we all know, barbecue, pizza, Thai curry and sushi are the main food groups and it was my duty to sample all of them in the name of science. Beef brisket smoked for 11 hours? Check. 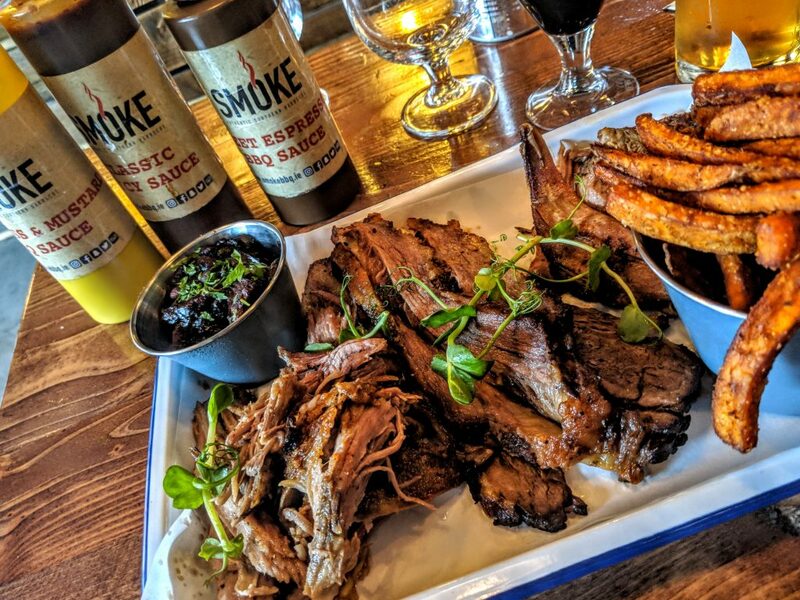 Not only that: at Smoke BBQ there’s lubricious lamb and podgy pulled pork, plus sausages, burgers, chicken wings and even a vegetarian option. 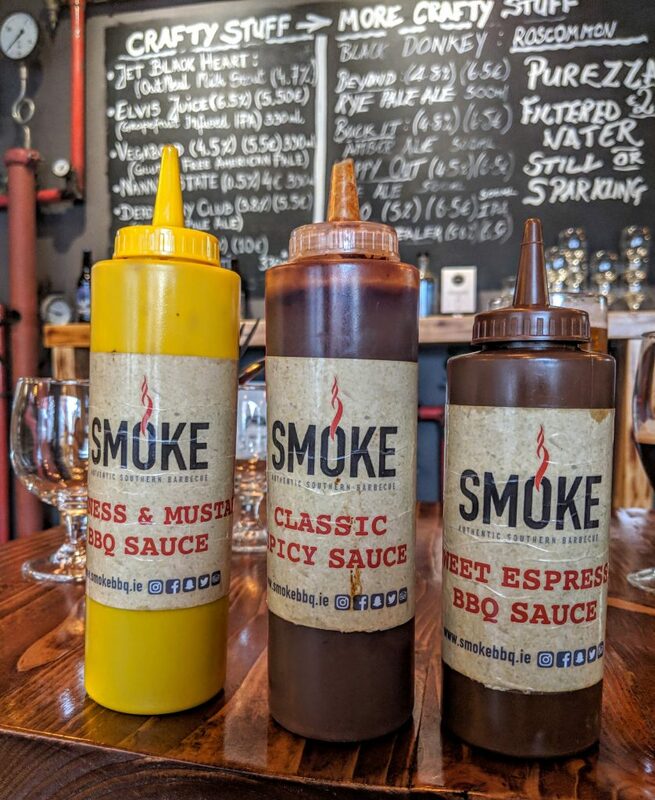 The team at Smoke are serious about smoking their meats and carefully grilling them to keeping them juicy and tender. I ordered the Triple Meat platter or, as I call it, the triple threat meat sweats, with lamb shoulder, beef brisket and pulled pork. Everything was cooked beautifully with a subtle chargrill flavour and a sublime softness. I asked the waitress, Doris, who hails from Croatia, about the smoking process. Each type of meat needs a different process: chicken only requires a couple of hours in the smoker, the beef burger about four hours, while pork and lamb are about 10 hours. The vegetarian burger, in case you are wondering, is made with chickpeas, corn, kidney beans, rice and topped with avocado, cheese, tomato and greens. 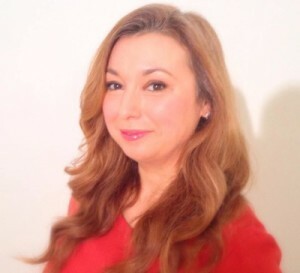 The home made sauces that accompany the meat are excellent: there’s a Guinness and mustard BBQ sauce, the most delicate, which goes well with the pulled pork; a classic spicy sauce, which you can dab everywhere; and my favourite, the sweet espresso BBQ sauce, a bittersweet kick to use in moderation. For sides I had the skinny sweet potato fries, which were remarkably crunchy and savoury with salt, pepper and chilli, and the brisket burnt ends beans, very salty and spicy. All mains come with some home made pickles. To wash all of this down I had a pint of Punk IPA 5.6% with hints of lemon and cinnamon. I also sampled the Jet Black Heart 4.7%, a Guinness-type stout with a strong coffee flavour. I went to barbecue heaven and got the meat sweats, and I suggest you dive right in, too. 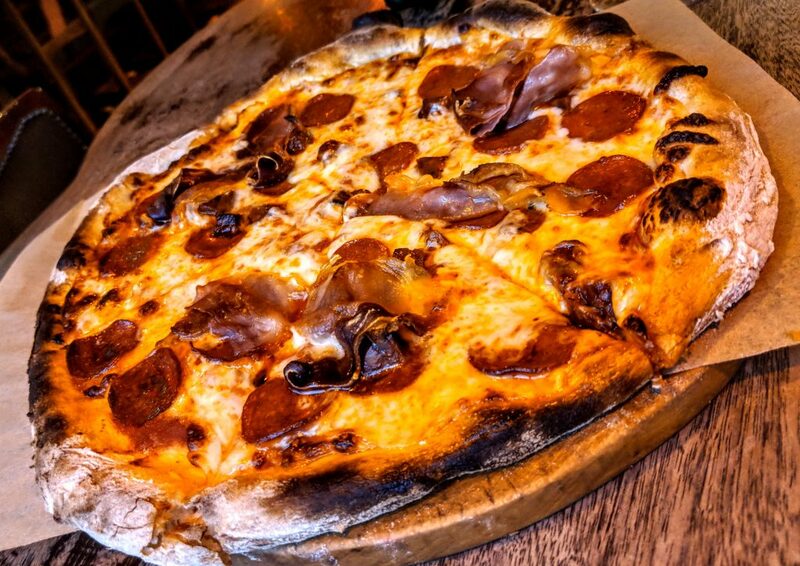 You wouldn’t normally go to a pub for pizza, although in London, for example, is quite common. Phibsborough has so much to offer to foodies and The Back Page delivers on many fronts. They make their own sourdough, which in itself is a labour of love and a badge of honour (if you are curious to know how to make sourdough, here’s the process). Is pizza world food? To me, pizza is the ultimate food, and, therefore, is universal. The pizza menu at The Back Page is very comprehensive from meat-intensive to vegetarian. I felt naturally drawn to all the meat I could get so my pizza had cured ham, chorizo and spicy sausage, which I admit was overkill but worth it. In hindsight, I should have ordered something a bit more balanced, maybe with some veggies thrown in, because all the cured meats are very salty, but this did not distract me from noticing the excellent texture of the pizza base. Proper sourdough creates air pockets during fermentation, which are sculpted into crunchy brittle bubbles in the oven. The pizza chef uses unbleached 00 flour. All the pizzas on the menu are inspired/dedicated to sports personalities like tennis champion Steffi Graf or the late Formula 1 champion Ayrton Senna. The toppings feature organic Irish ingredients like wild rocket from Wicklow, mozzarella from Kerry and sheep cheese from Carlow. 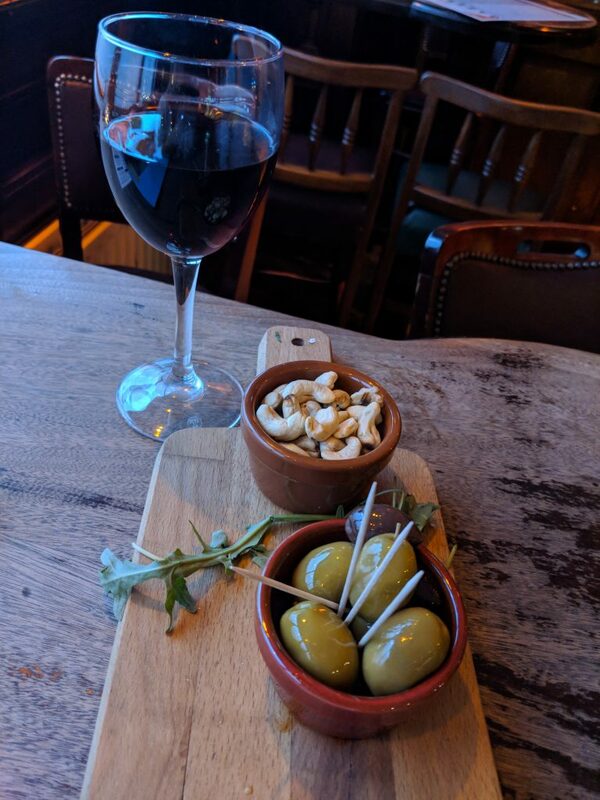 During the week you can take advantage of their pizza and pint (or glass of wine, in my case an Argentinian Malbec) or pizza and salad offer. These deals are only available off-peak before dinner, but they are great value. The Back Page fully supports sustainable, local, organic food suppliers. 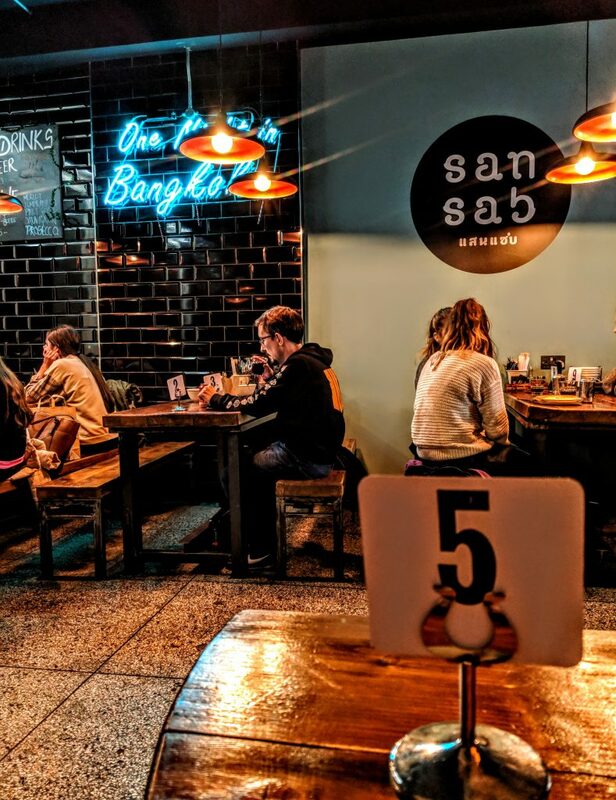 San Sab is a popular Thai joint with Thai chefs using their own traditional recipes using local ingredients. 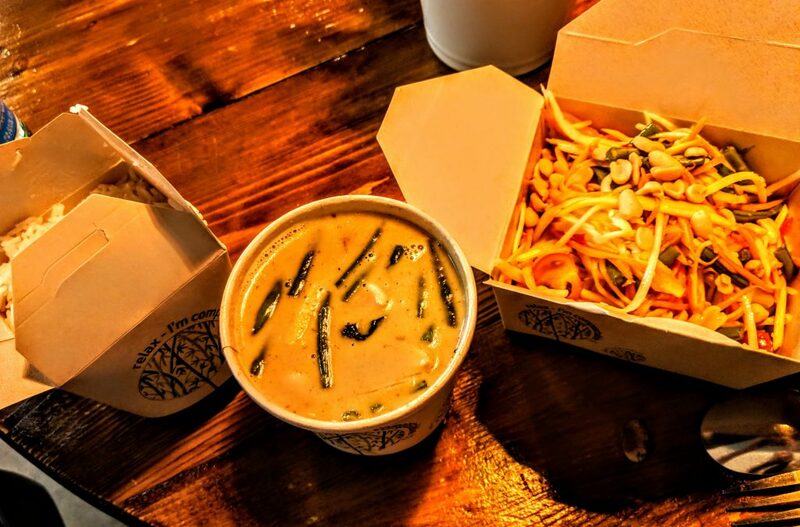 It’s also an award-winning restaurant because it bagged the Best Curry in Ireland Award in 2018 at the National Take-Away Awards. During my visit I ordered the spicy green papaya salad and the Thai green curry with chicken. The salad had both heat and freshness from red chillies and iceberg lettuce, plus the usual ingredients like peanuts. The Thai green curry was creamy and fragrant with lime leaves and Thai basil. Green beans were featured heavily in both dishes, which is understandable as you need to use ingredients that are easy to source, and I didn’t find typical Thai ingredients like pea aubergines in the curry. The food is packed with flavour and is very satisfying, and I can see why there are so many regular customers, especially students from the nearby university and office workers. Atami is mainly a takeaway joint, but there are enough tables inside for a spot of lunch or dinner and the décor looks really authentic. I saw on the window that there was a bento box lunchtime special, which is not featured in the online menu. 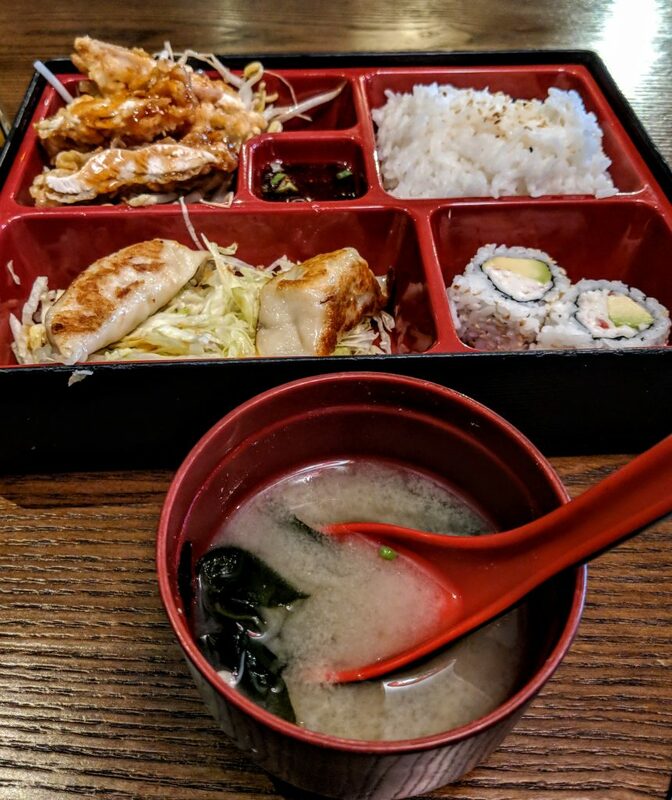 The bento box I had included breaded chicken strips with beansprouts, boiled rice, two gyozas/potstickers on a bed of shredded lettuce accompanied with a tangy dipping sauce and two pieces of sushi with crabmeat and avocado. The bento box came with a bowl of miso soup. 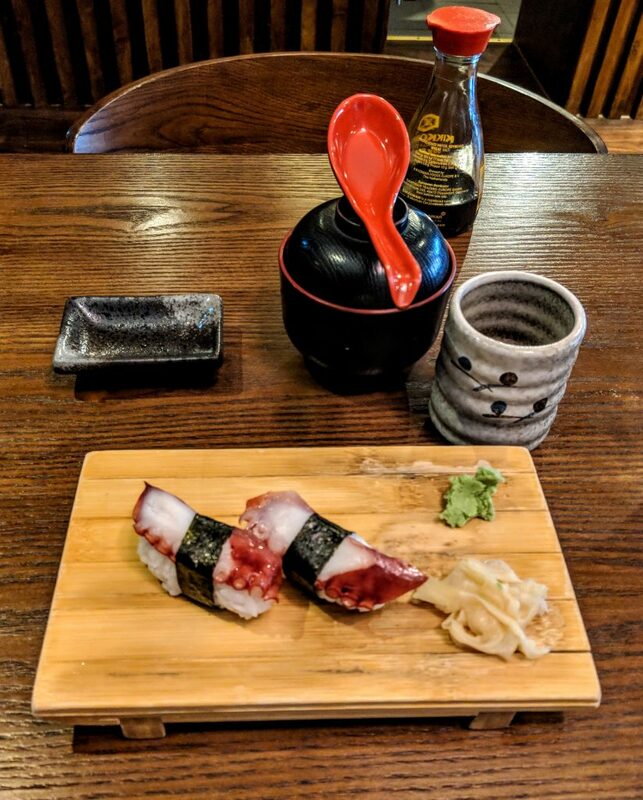 I also wanted to try some more sushi so I ordered the octopus sushi as a starter. The octopus was tender and not chewy, with a very subtle flavour. The chicken had a lovely crispy coating and the gyozas were cooked perfectly. I tried making gyozas from scratch once, including making the dough for the wrappers, and cooking them requires a lot of skill because they need steaming and searing in a pan. As I sat at my table overlooking the entrance to the kitchen I thought of the 2008 movie The Ramen Girl. Atami has the same informality as the ramen place featured in the film. Maybe next time I visit I should get the ramen. On the menu there are currently six types of ramen with chicken, beef and seafood; the Atami ramen includes all three plus fried tofu, egg, shiitake mushrooms and Chinese barbecue pork. 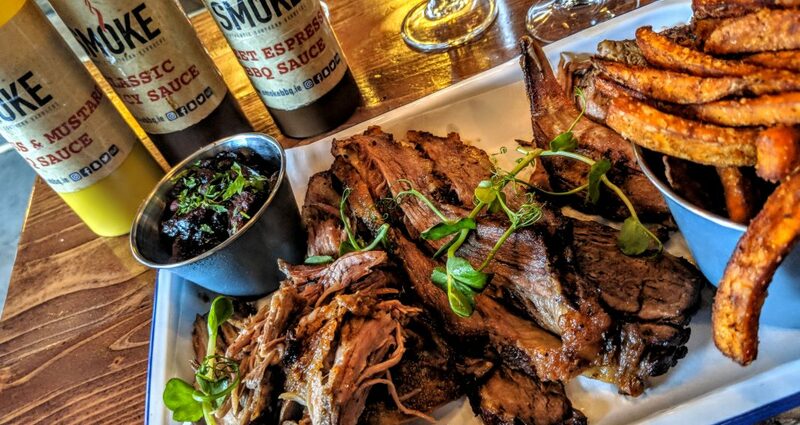 While it’s difficult to pick a favourite from this varied selection of world foods, I must say that I was very impressed with the Southern barbecue joint in Athlone. Of course, this is not a comprehensive guide, but there will be more foodie tours in the future. In the meantime, why not read the battle of the brunch article about Clontarf in Dublin?